We are knocked out by this gorgeous, picture-perfect, vase-ready sunflower with deep golden yellow flowers circling a pure black center. A pollen free hybrid, the fast-growing plants - 45 days from seed to vase - can be sown three times in a single summer. Sunflower, Jua Maya Hybrid is rated 5.0 out of 5 by 1. 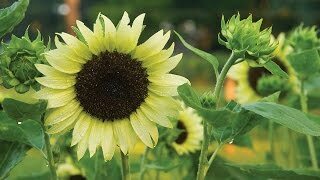 Rated 5 out of 5 by amateur gardener from Great sunflowers! I grew these last year and will plant them again. They are quick and easy to grow, with almost every seed germinating. I love their dark centers, contrasting with the golden petals, and at about 6' they were a nice backdrop to the rest of my garden.